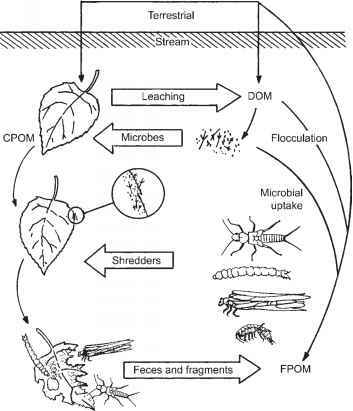 The basal resources of stream food webs are primary producers and detritus, which together comprise a diverse mix of energy sources, the importance of which varies with environmental conditions. Algae in surface films are prevalent in small streams through mid-order rivers that receive adequate light (Figure 7.13), and planktonic algae are a possible energy source in large lowland rivers. Detrital energy sources are ubiquitous, although the processing of CPOM (Figure 7.3) is primarily a feature of low-order streams within forested regions. Clearly, the relative importance of these basal resources varies with position along the river continuum (Figure 1.7), as Vannote et al. (1980) articulated for a river network originating within a forested landscape. Under those circumstances, the basal resources of headwater streams are dominated by inputs of leaf litter, mid-order streams receive sufficient light to support greater productivity of benthic algae, and large lowland rivers are dominated by FPOM and DOM, although some phytoplankton also are present. Functional feeding groups of macroinvertebrates are presumed to track these longitudinal patterns in resource supply. The river continuum concept has proven to be a resilient encapsulation of the relative roles played by different basal resources along an idealized river system. Furthermore, the longitudinal distribution of functional feeding groups often, although not invariably, can be shown to be at least approximately in accord with expectations (Figure 14.4). Nonetheless, the applicability of this model to running waters worldwide has been questioned (Winterbourn et al. 1981, Lake et al. 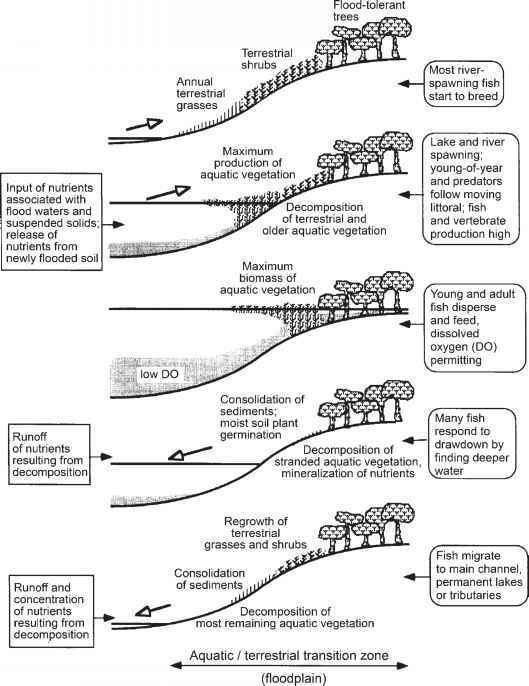 1986, Statzner and Higler 1985) and it is apparent that the hypothesized pattern of changing energy pathways from headwaters to river mouth is only a first approximation of a more complete understanding of how energy is utilized within lotic ecosystems. In particular, energy supplied via microbial pathways and from lateral inputs both deserve much more attention, and there is growing evidence that the quantitatively largest energy sources are not necessarily those of greatest importance to consumer production. Although DOM and FPOM are unquestionably the largest C pools in lotic ecosystems, budget analyses (Section 12.4.1) reveal that their utilization is modest relative to export. However, as we learn more about the functional linkage between primary production and microbial utilization of DOM and FPOM within biofilms, especially in low-order stream networks, and of the longitudinal decline in DOM concentrations evident in large lowland rivers (Figure 12.9), it is apparent that substantial quantities of organic matter are mineralized by microbial activity along the river continuum. Whether this microbial production is a link to macroconsumers or is mostly dissipated by the respiration of microbes and the meiofauna remains uncertain. Biofilms may also serve to blur the boundaries between primary producer and detrital energy pathways, and so contribute to instances where functional groups correspond less well to expectations under the river continuum concept. (Dettmers etal. 2001). These apparently contrasting findings may reflect differences in the role of floodplain inundation in tropical versus temperate settings, or between more pristine versus more constrained rivers with more developed floodplains. In rivers that have high primary production, are regulated, or where the floodplain is not as productive as the main channel due the timing of the flood, fish production may be more dependent on in-channel production (Junk and Wantzen 2004). In rivers with extensive flooding driven by an annual flood pulse, the original model may apply. There is no question that detrital energy sources are important inputs of organic C in virtually all lotic ecosystems, but budgetary accounts of inputs and exports may fail to provide an accurate view of the energy supplies that fuel higher trophic levels. However, by analyzing the signature of certain isotopes in animal consumers it is possible to identify their primary food supplies, and in a number of instances where the energy sources were assumed to be allochthonous, a surprising dependency on autochthonous production was revealed. Isotopic signatures of fishes and invertebrates indicated that transported organic matter, including living and detrital algal components, was the main source of C for primary consumers in both constricted and floodplain reaches of the Ohio River (Thorp et al. 1998). In the Orinoco floodplain, macrophytes and leaf litter from the flooded forest represented 98% of the total C available, but isotope analysis showed that phytoplankton and periphyton were the major C source for fish and macroinvertebrates (Lewis et al. 2001). In addition, isotope data did not indicate that vascular plant C reached invertebrates through the microbial loop, suggesting instead that virtually all detrital C entered a "microbial dead end'' and thus did not contribute to animal secondary production in the Orinoco floodplain. From the perspective of ecosystem metabolism, large lowland rivers do indeed have a low P/R ratio and are highly heterotrophic, reflections of the high microbial respiration supported by DOM and POM. Secondary production by macroconsu-mers, however, may be based to a much greater extent on autochthonous production that occurs within the channel or inside channels and flood-plain lakes (Figure 14.6). 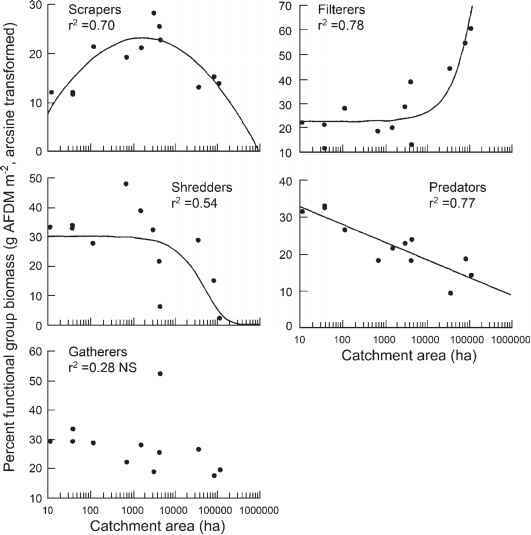 According to the riverine productivity model (Thorp and Delong 1994, 2002), autochthonous C fuels secondary production in rivers with constricted channels and can be an important but not the main source of C for macroconsumers in rivers with floodplains.